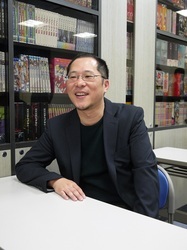 Being in the industry for almost 30 years now, Yoshitaka Kawaguchi joined Sunrise in 1988 and started work as an animation producer as production coordinator on City Hunter 2. In 1993 he took on the role of setting coordinator on Mobile Suit V Gundam. Less than 10 years later, his debut as a producer was the 2002 theatrical release of Turn A Gundam. Since then he has produced a series of hits including Overman King Gainer, Planetes, Wings of Rean, Code Geass Lelouch of the Rebellion and Code Geass Akito the Exiled. He continues to focus on producing original works to this day.